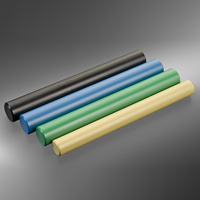 When you need peak performance from your plastic parts, choose PEEK (Polyether ether ketone) plastic. This unique, semi-crystalline, high temperature engineering thermoplastic is ideal for applications where thermal, chemical and combustion properties are critical to performance. One of the most sought after properties of PEEK material is its ability to retain its flexural and tensile properties at temperatures over 250C (482F). Because of its tolerance to high temperatures, it’s well suited for aerospace and automotive industries. PEEK is an ideal material for high-demanding parts like bearings, piston parts, pumps, high performance liquid chromatography columns, compressor plate valves, and electrical cable insulation. As an advanced biomaterial, it’s also often used in medical implants and spinal fusion devices. If you need a high performing plastic material, consider PEEK as your plastic of choice. The Plastifab team can help you pick this or any other plastic that is best suited to your application. Request a quote today or contact us for a consultation on all your plastic needs.